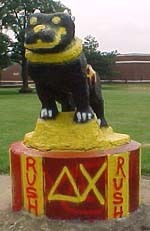 Kettering-A Delta Chi – The Home of the Kettering-A Delta Chi Chapter! Welcome to the Kettering-A Delta Chi Chapter! These are the words that we, the Kettering-A chapter of the Delta Chi Fraternity, live by. Delta Chi is a social fraternity established in 1890. The Kettering-A chapter was colonized in 1996 and received its charter in 1998. When Kettering A-Section is on a school term, which is generally in the months January through March and July through September, we host a number of social events that all Kettering students are welcome to attend. The most popular of these is the first week LAN party. This always occurs First Friday and starts after your last class of the day. To learn about our other events, please visit our calendar. When A-Section is on a work term, which is generally April through the end of June, and October to December, we still find time to hang out together and have a good time. Most of our brothers are in the south-eastern region of Michigan, near Detroit and its suburbs, and there are always get togethers happening, which you can also find on the calendar. Feel free to contact any of us if you’re interested in meeting up and doing something! Most fraternities on campus have a recruitment strategy known as “rush”. This strategy involves a two week period, generally between second and forth weeks, where large and expensive events are held to entice freshmen. After this period, they give bids to the subset of attendees that are male, signed the guest list, and talked to a few of the members. This has been the traditional mode of recruitment throughout most American college campuses, both “traditional” and non-traditional schools. Delta Chi has a very different strategy. We do not rush. We do hold events, but rather than concentrating them during the formal rush period, we attempt to space them throughout the term so that not everything is scheduled at once. A lot of these are informal events where we ask a few people we know out to catch a movie, or throw a dry-party to hang out with our independent friends and freshmen. In general, if you are interested in Delta Chi, the best thing to do is come out to our house when we have events, hang out at our tent, and get to know us. Additionally, as Delta Chi was founded as a law fraternity, we do occasionally discuss legal matters and can be a little obsessive about rules, following them, and how to change them correctly. Our meetings are run utilizing parliamentary procedure, and this has been proven to help our chapter be recogonized on campus as the authority on parliamentary procedure, conducting meetings, ritual, and leadership in general. Joining Delta Chi does have a financial obligation. Please feel free to ask about this, but we do feel that it is non-burdensome and those interested should also be aware that there is financial help available for fulfilling these obligations through your school loans available through the financial aid office of Kettering. We at Delta Chi have wide variety of members. We have members from most of Kettering’s departments, including Mechanical Engineering, Industrial Engineering, Electrical Engineering, Computer Engineering, Computer Science, Applied Physics, and Management. Major does not dictate interest entirely, however. Many of us are into video games, movies, music, playing music and singing, RC cars (and occasionally helicopters and boats), and dozens of other things as well. It’s safe to say that you will find friends with similar interests to your own among our chapter.